← January Showers Bring…… Umbrellas! 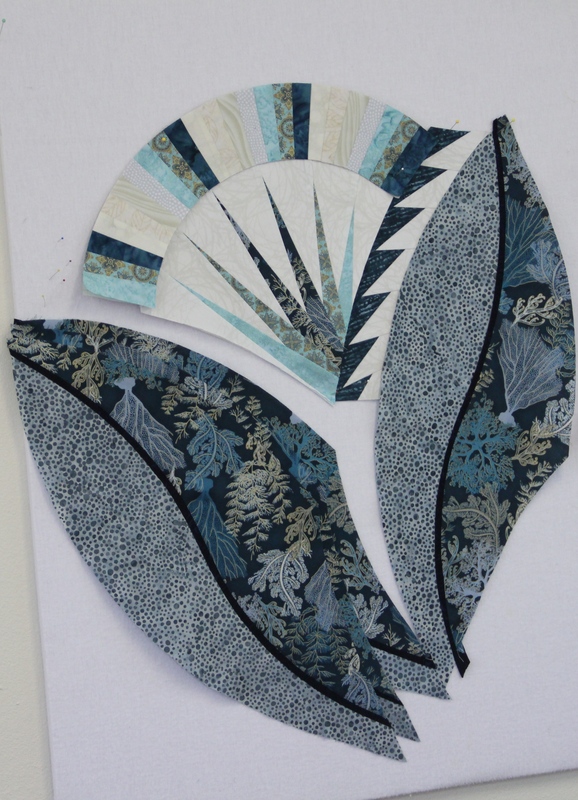 Hot Hot Hot – Fire Island Hosta – Retreat! 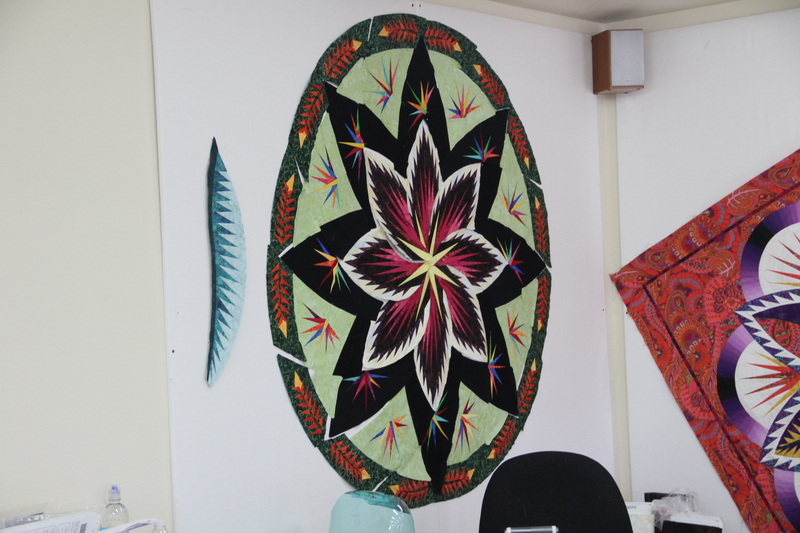 I had the privilege this weekend to teach a fabulous group of women at a quilt retreat I held at the Wimberley Quilt Ranch. This was the 2nd time I had hosted a retreat here and I really enjoy this facility. This time we also had the owner of the retreat center join us. 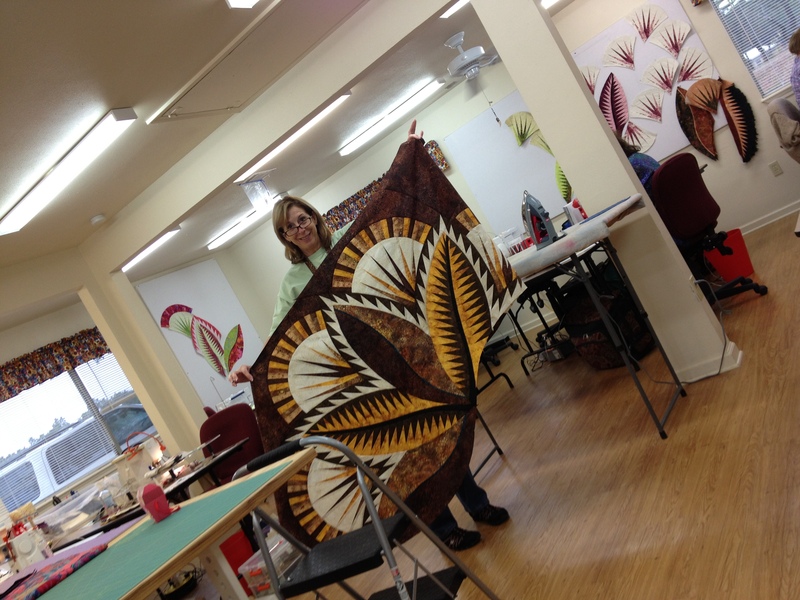 It was a pleasure getting Diane hooked on Judy patterns! Because our retreat was full with a waiting list Diane would head back to her home (just down the road) each night to catch a few winks (or bottle feed the calf)! She did say she really sees the value of being able to just stay and “retreat”! I think we will talk her into staying the night at the June retreat, which I am just finalizing the details on. 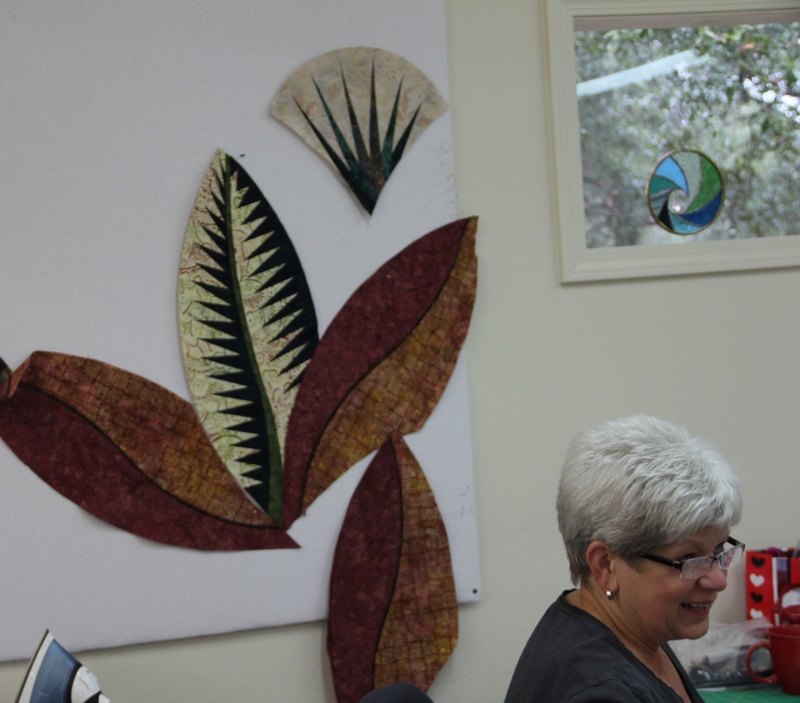 The next retreat is at the end of April at 12 Pines Retreat Center – see photos of that project below! 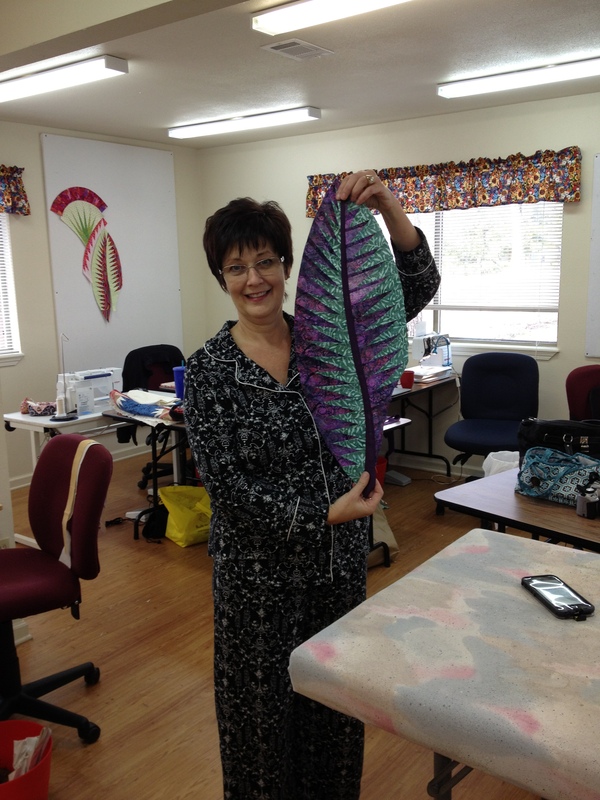 Our next retreat at Wimberley Quilt Ranch is for “Beginners and Finishers“. 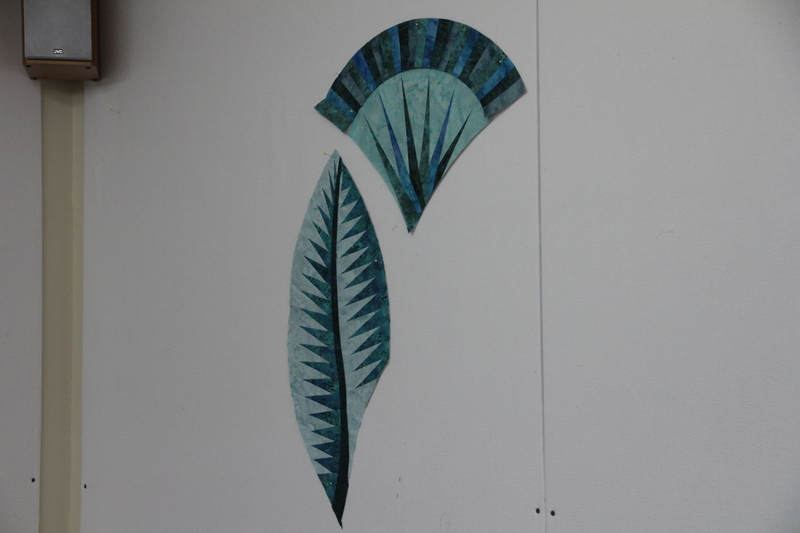 Here are the photos from our Fire Island Hosta Retreat! Ronda enjoying the beautiful sunset. See more on her blog! 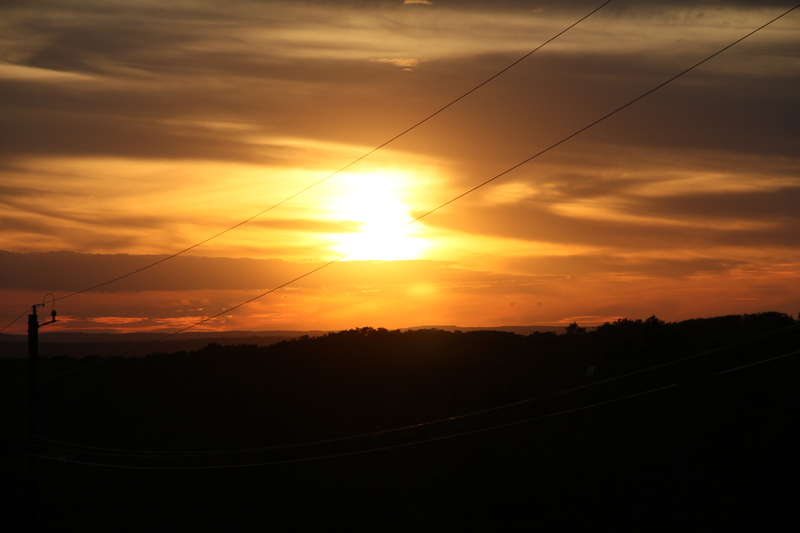 Thursday evenings sunset – there were several of us on the porch enjoying this one! 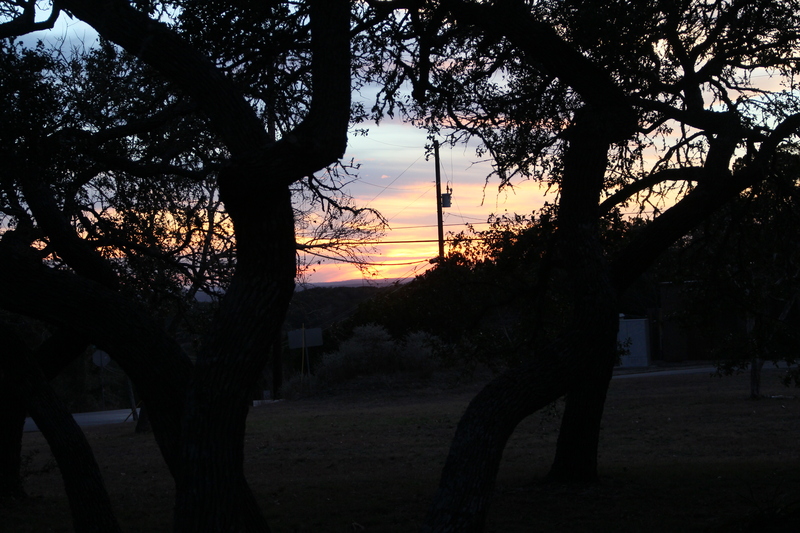 Sunset through the trees – the trees at WQR are AMAZING! I walked to the end of the road to get this shot – fabulous! 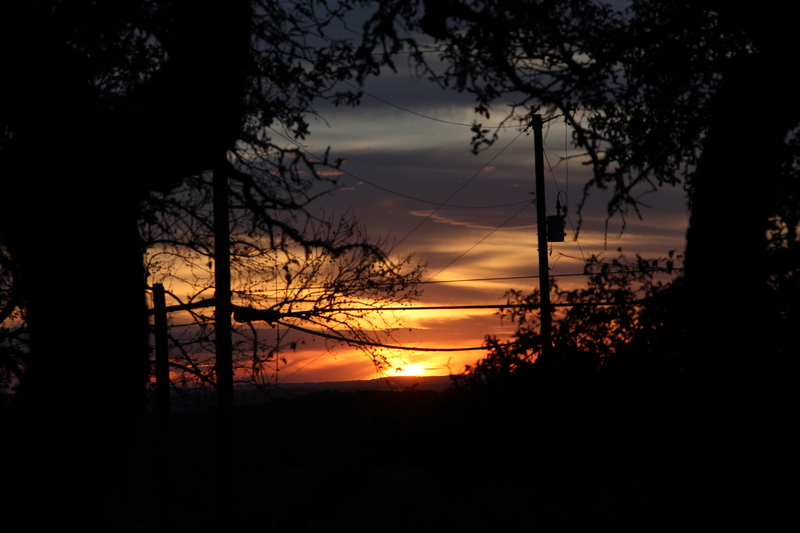 And the last glimmer…. 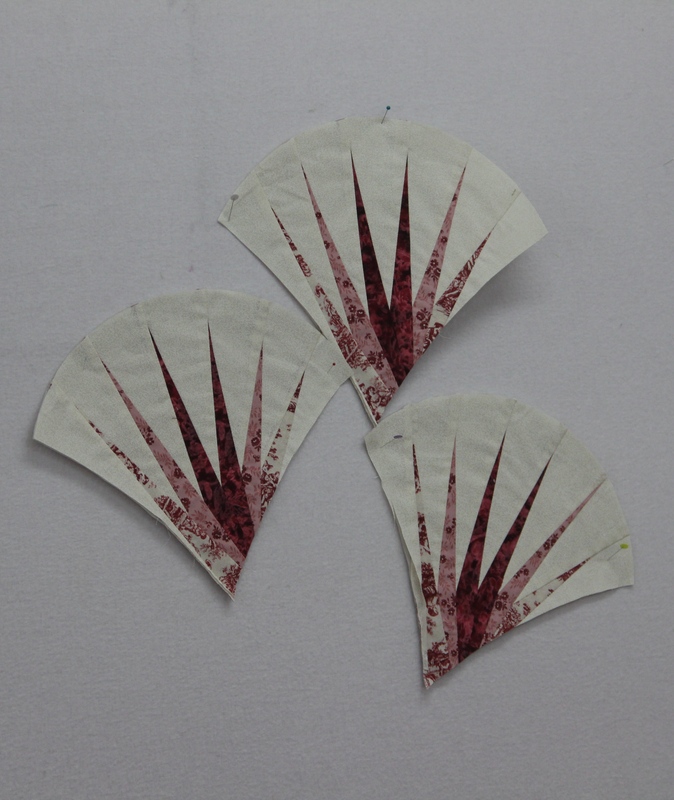 We wanted to enjoy every last drop! 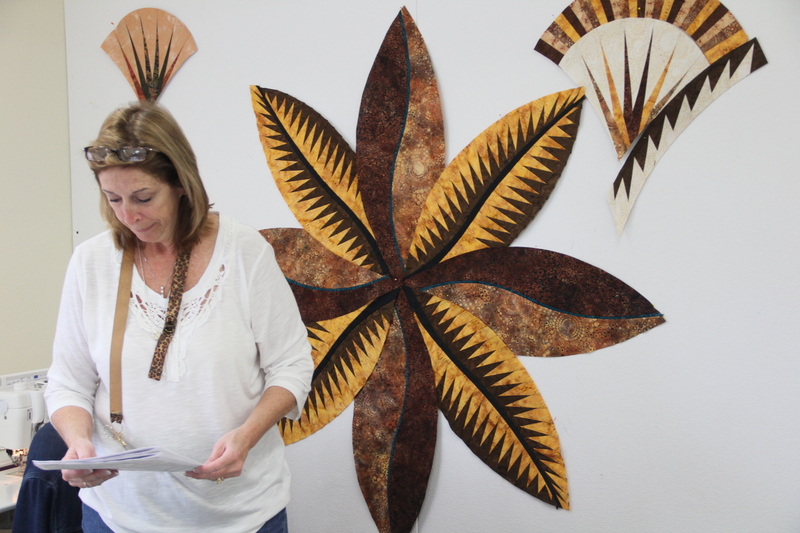 Cathy had never paper-pieced before. 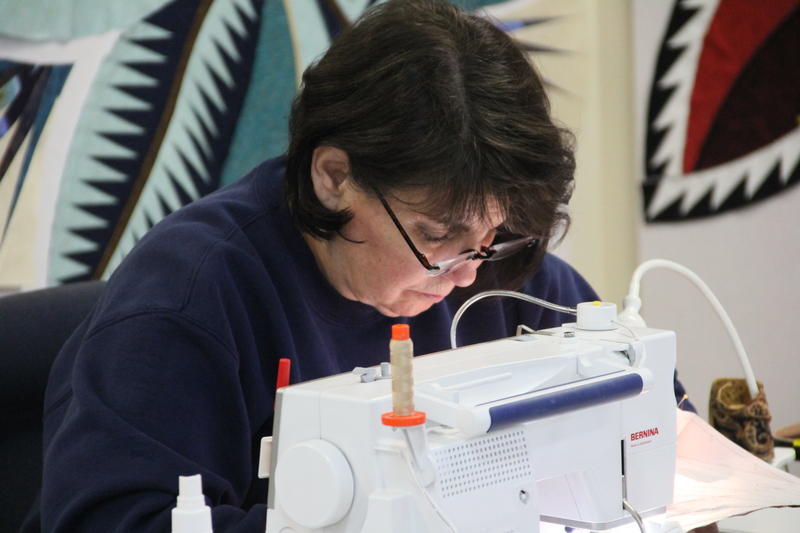 Her friends coached her prior to retreat so she could have some of the basic piecing done – and now she has her first vein pieced. I love her colors! 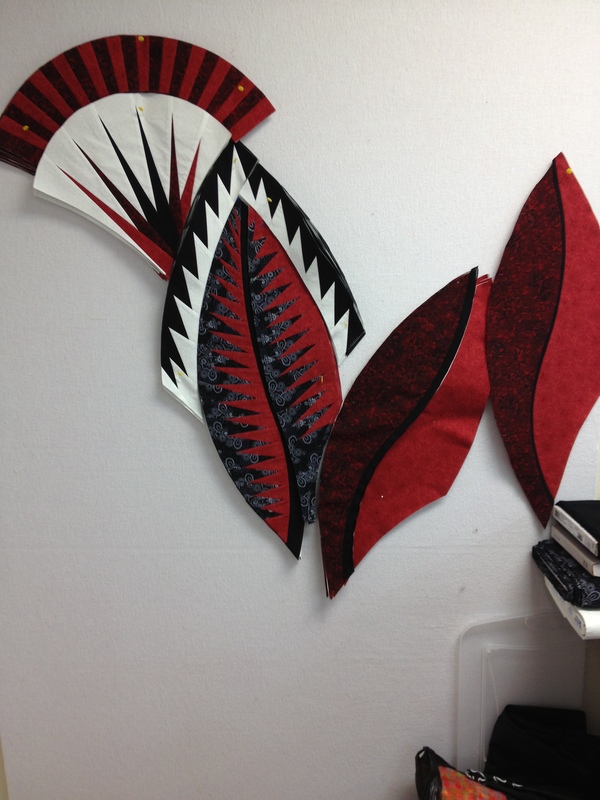 All of Lou Ann’s leaves are done! now she is reading what she does next! 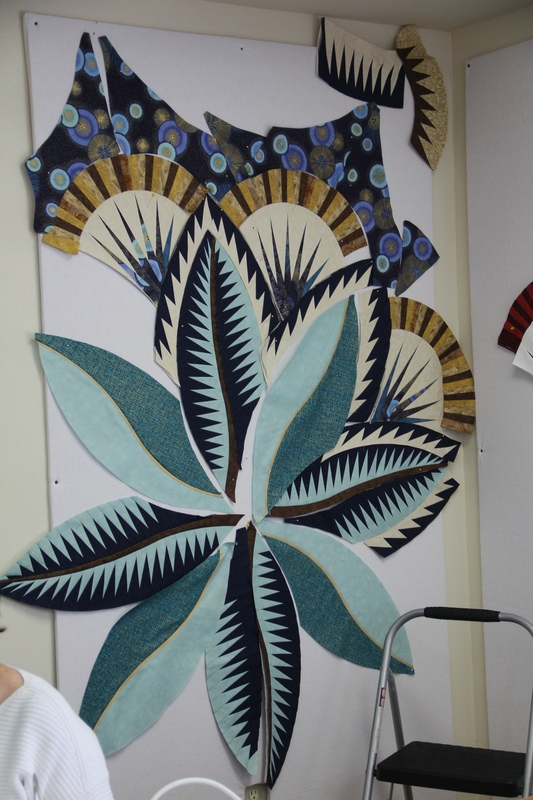 This one is Linda’s – she had purchased her fabric before the pattern was ever released – started working on it the day she got her pattern. 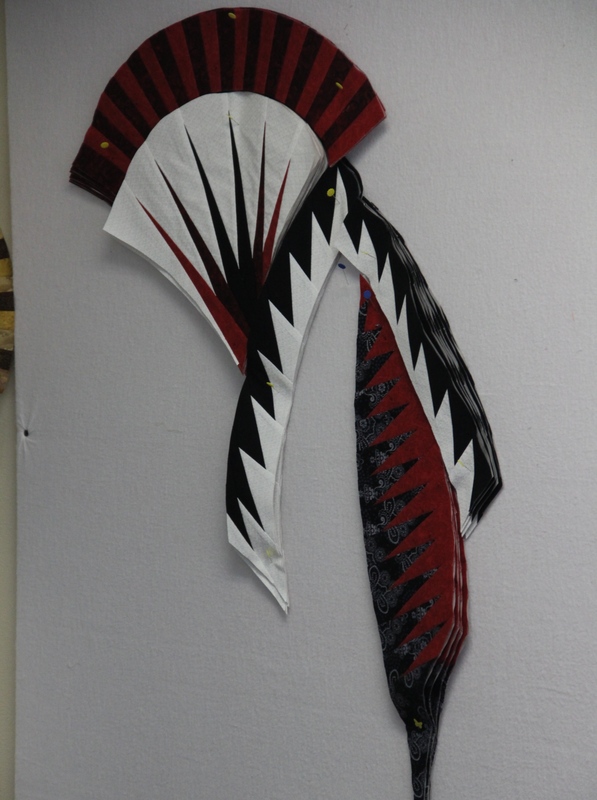 Then got stuck on the veins – she was happy to come to retreat just to learn how to do the veins! 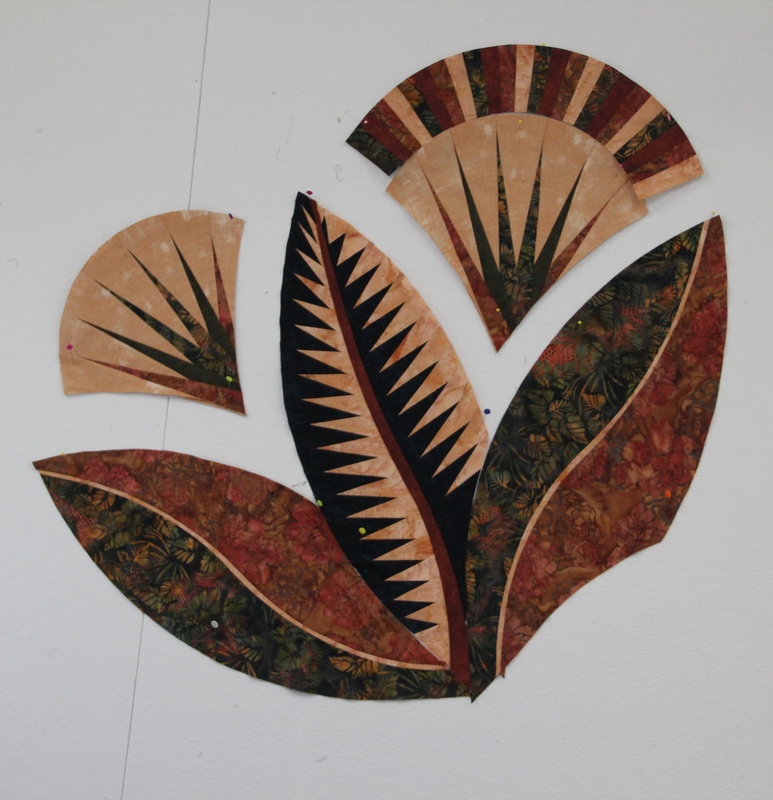 Melba’s colors are going to be fabulous – I think this is her first Judy project. 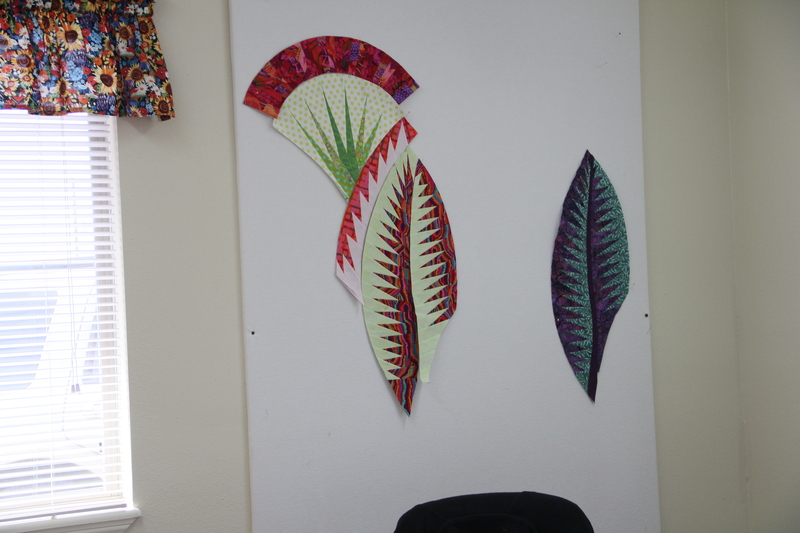 I wish I had gotten a photo of her project with her leaves up there – dang! 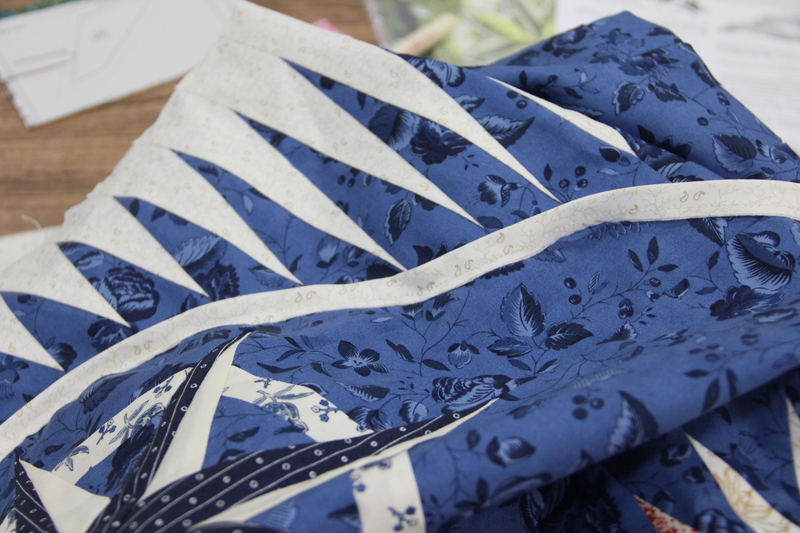 PS – she used one fabric in her arcs – but paper-pieced it to get lots of texture! April’s retreat – Paradise in Blooms – we are filling up for this one – let me know if you want a registration form – spots are going FAST! 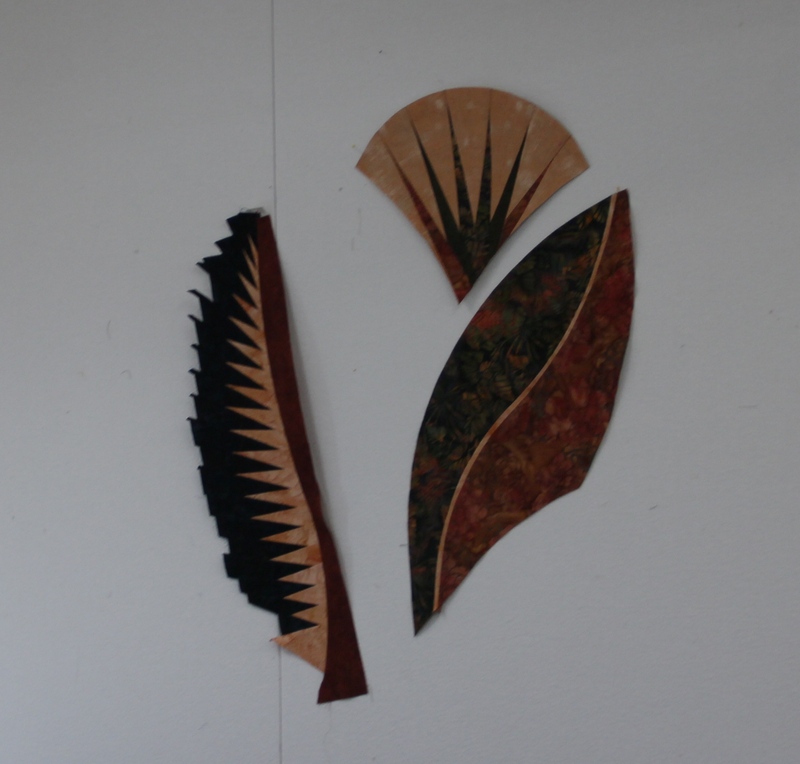 (Lisa’s Fire Island Hosta is hanging up there too – THANKS Lisa for sharing your design wall with me! 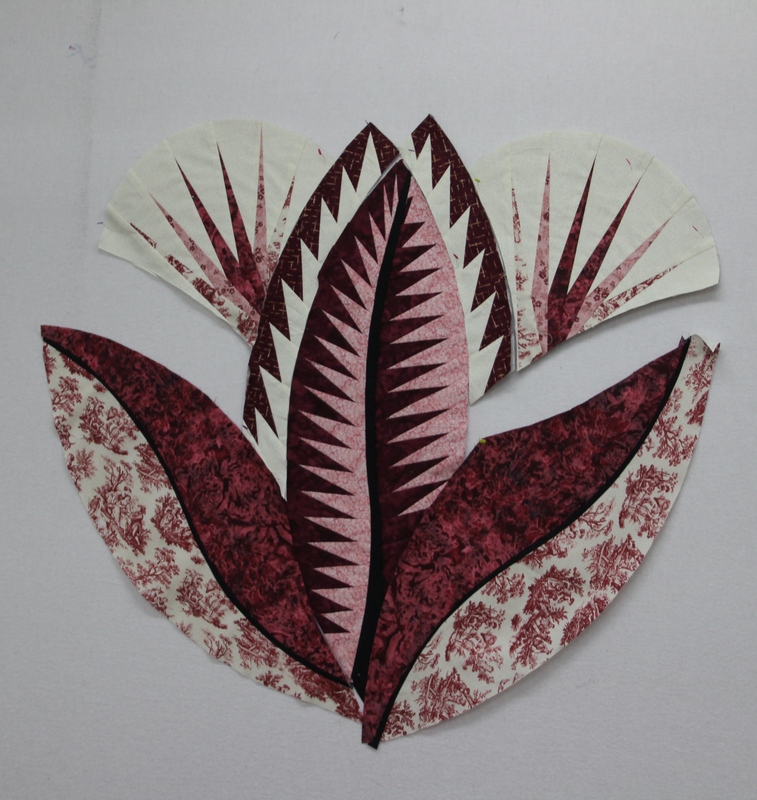 LaVonne had never paper-pieced before – and I think she is going to enjoy it! She did GREAT! 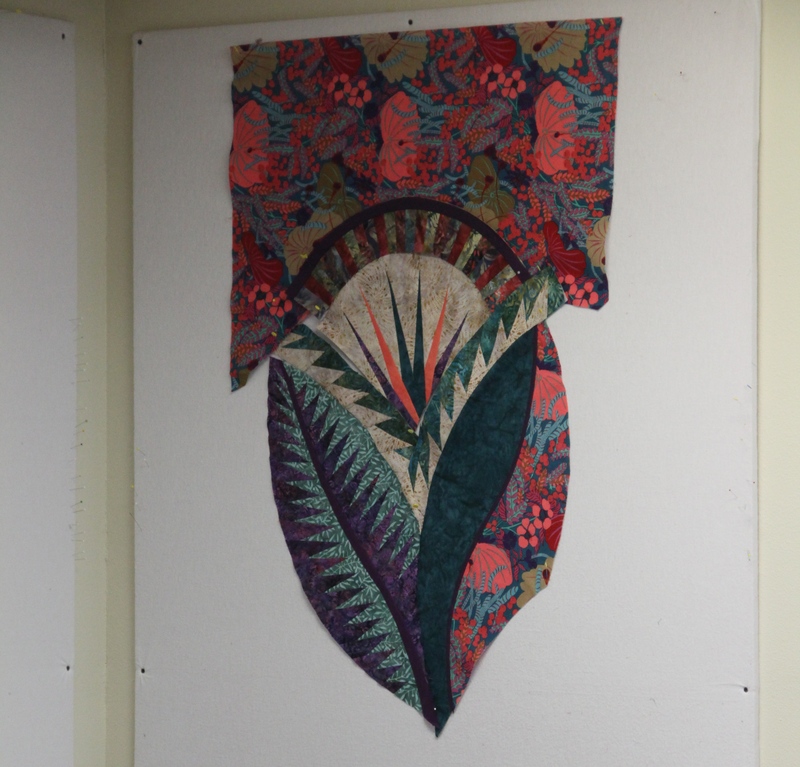 You will see more of her quilt later in the photos! 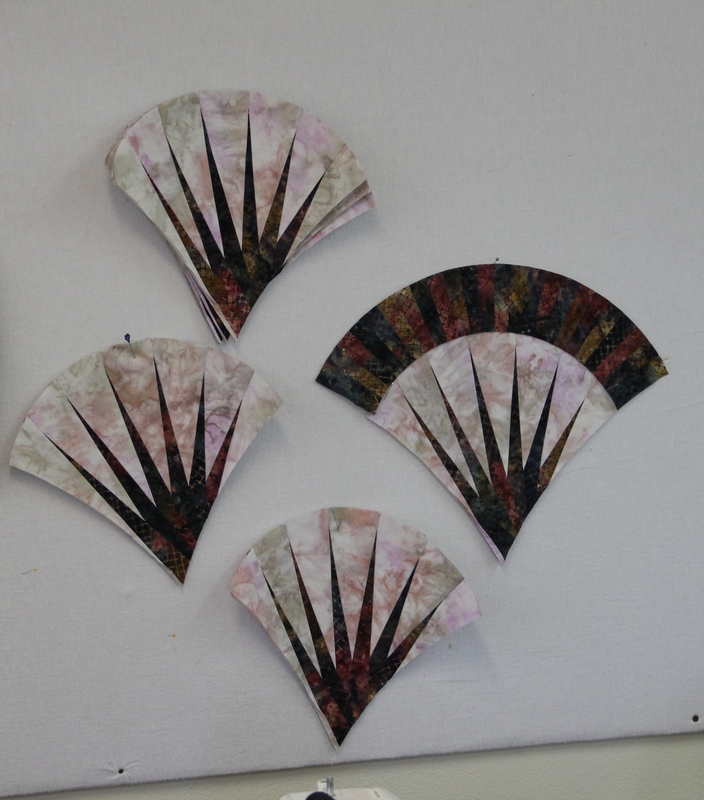 Mary had attended one other class with me the pattern was “Hoffman Crackers” and a very simple pattern. 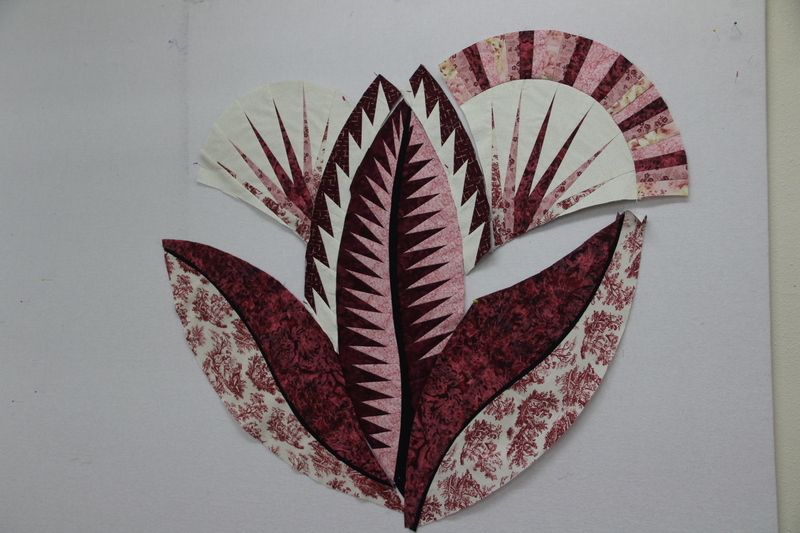 I am so excited that she wanted to join us for FIH – her quilt is going to be fabulous! Aw Brenda – this fabulous! 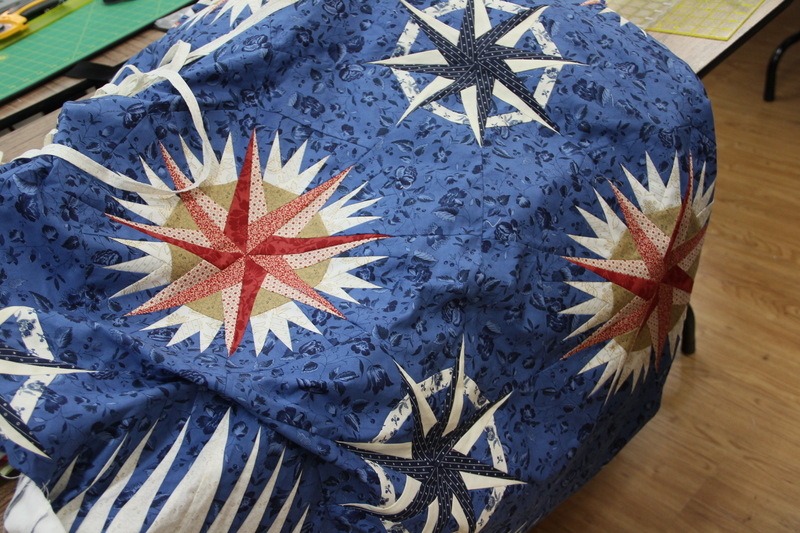 Her first Judy quilt (and I think paper-piecing) was Captain’s Wheel at Wimberley Quilt Ranch last year. I think she is hooked! Oh Cheryl you are such a tease – we want to see more! 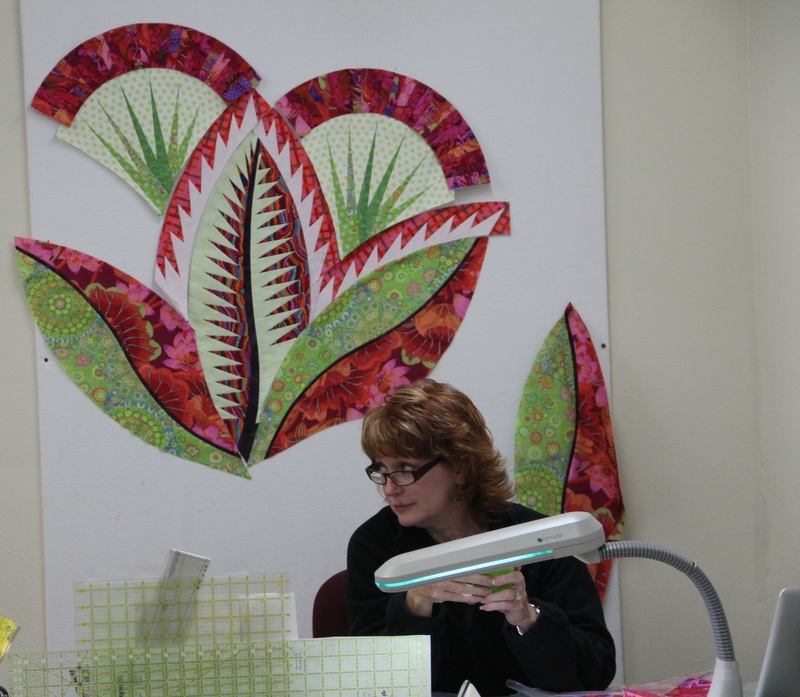 Look at Cathy’s focus fabric – WOW! 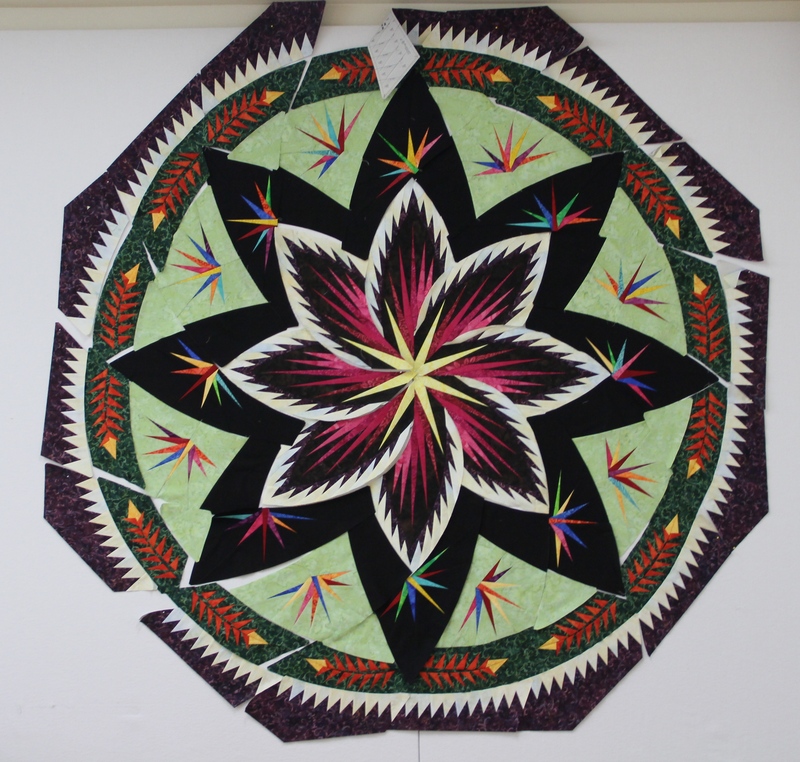 And we have a top – now time for the borders! 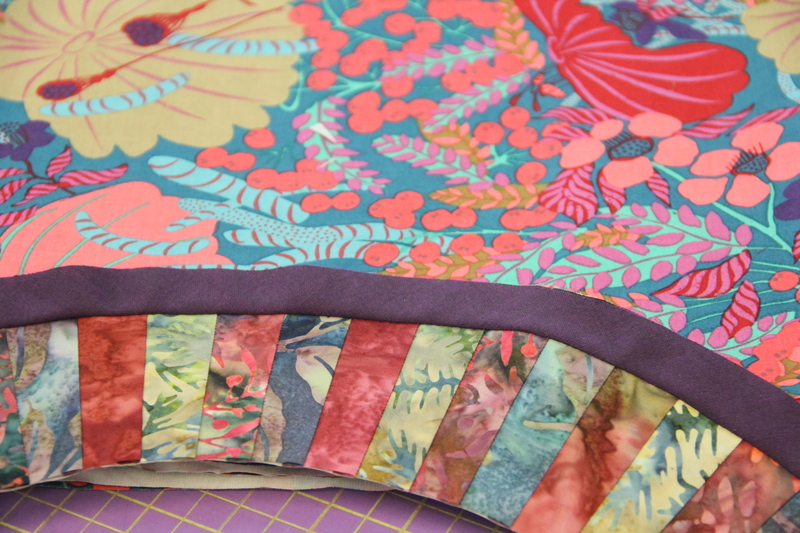 Lisa’s colors are going to be fabulous – she has made many Judy quilts and I think she was enjoying the journey this one is taking her on. She will be joining us in April for Paradise in Blooms! 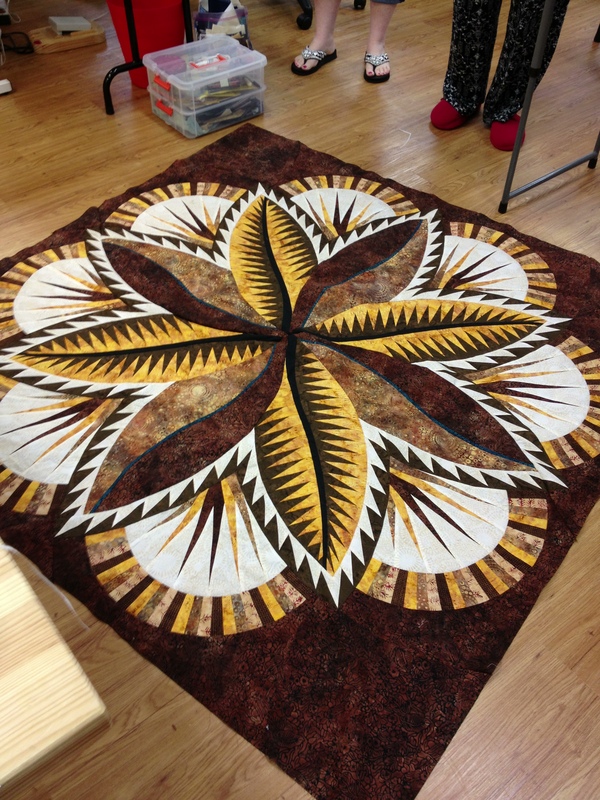 And Ginger’s quilt makes an appearance – those are beautiful salmon colors with rich browns – going to be fabulous! 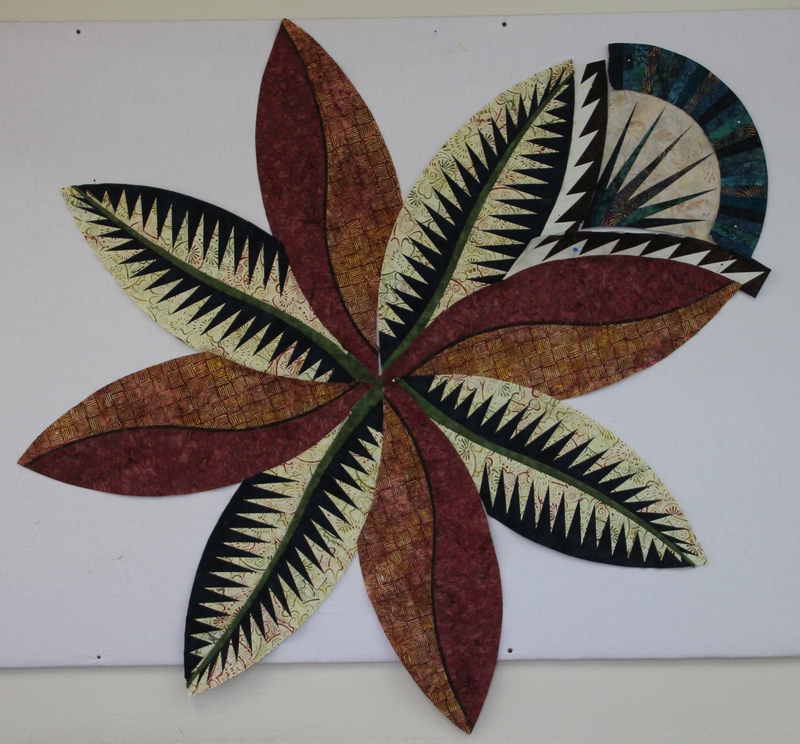 Remember our first time paper-piecer – yes this is LaVonne’s. You can also see a hint of Mary’s to the left. Cheryl is hard at it! 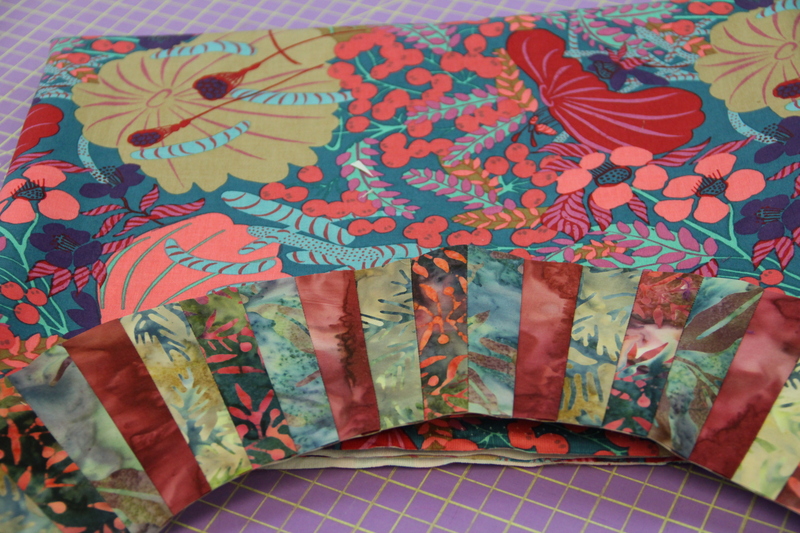 Cathy had an oh oh moment – her arcs were going to blend with her focus fabric – what to do – what to do…..
Add an accent – this was SO easy – I love demonstrating this technique! Some of you know how it goes at retreats – this person is hot, this person is cold – well we had little red riding hood here. I think she just wanted to wear that scrumptious cape from Ireland! 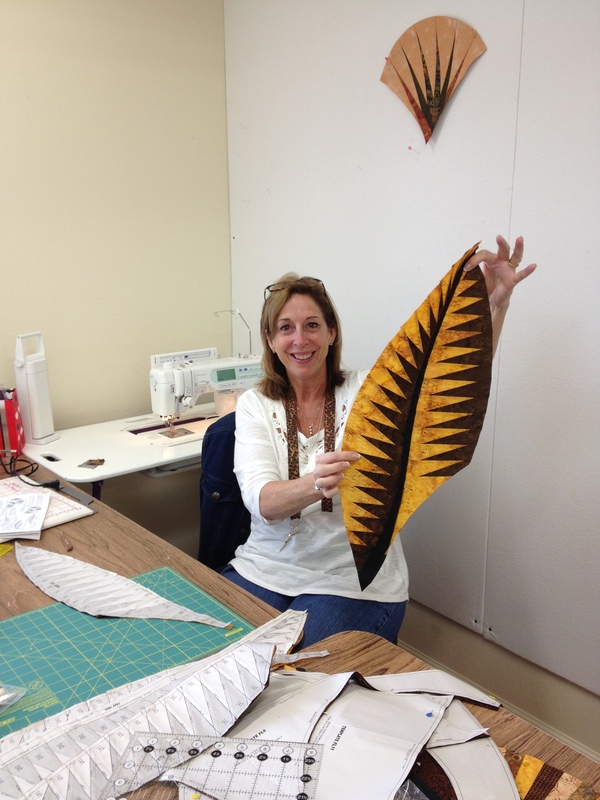 PS – Diane is purchasing deflectors so each retreat can adjust there personal sewing zone! 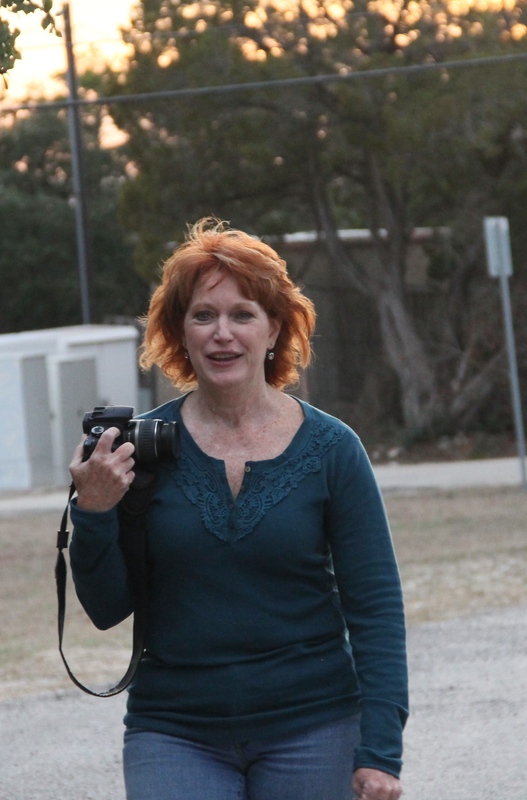 Ginger – I am in love! Those colors are fabulous! 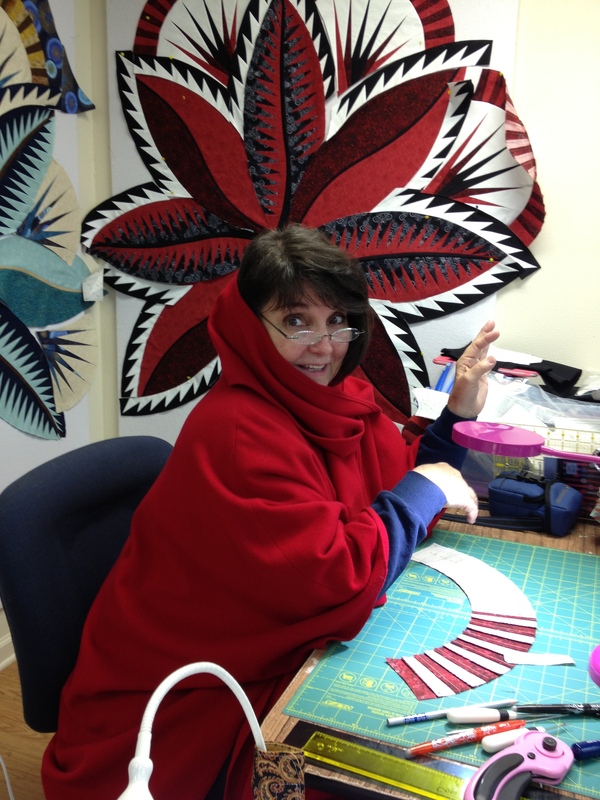 Ronda is making progress – she is also our fabulous cook so she doesn’t get to sew as much as the rest of us! Oh Cathy – I love it! – FYI – Cathy is playing with this and there may a surprise in a future post! 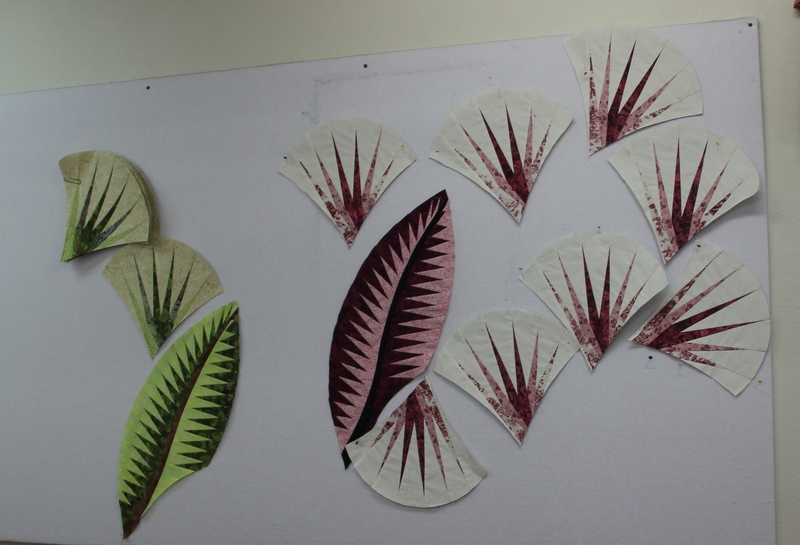 Stay tuned by “following” the blog! Lou Ann is DONE! 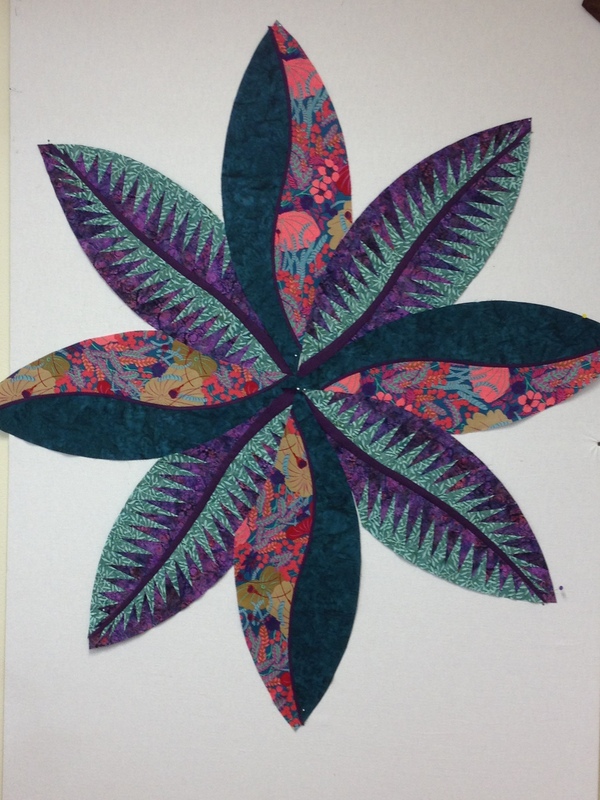 She decided to add just a little punch of color – her veins on 4 of the leaves are turquoise and turquoise was added to her accent borders! Diane got a lot done – even though she was still working on the ranch part-time feeding the bottle feeding the calf and manning the gates so the hay could be unloaded! Lou Ann’s next project is Garden Wall! 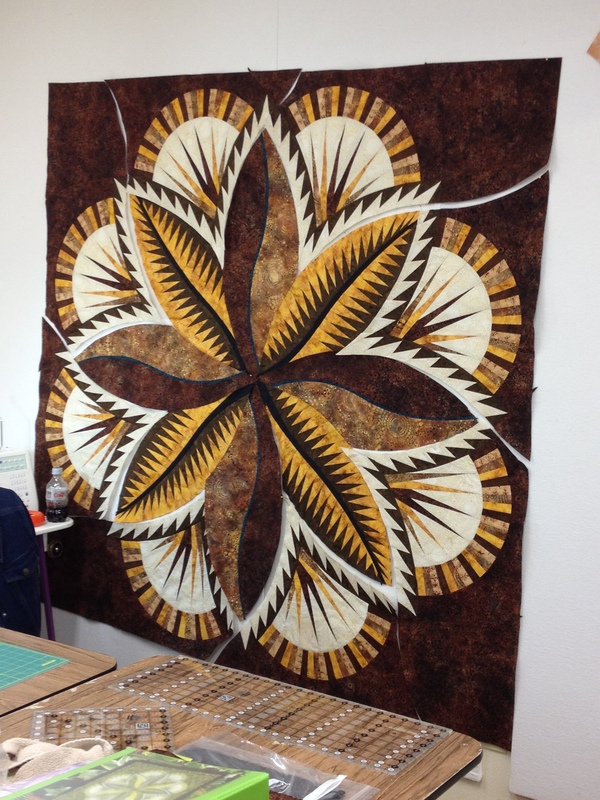 With the Judy Niemeyer Bali Pop’s – perfect for this project! This is Ronda’s Captain’s Wheel – she wanted a little help with the rope – this is another favorite technique for me to demonstrate – I have worked up a super easy way to do this! And here is Ronda’ Captain’s Wheel – she will finish the rope at home – when she does a blog post I will be sure to share! I finished my NR/NL sections – whoop whoop! Retreat Info Here! 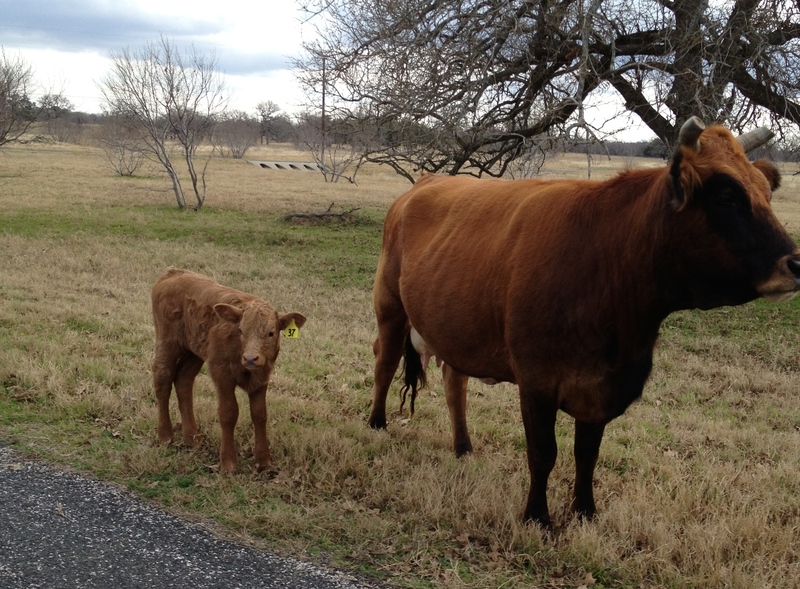 Hey Diane – this little calf greeted me when I got home Sunday! I just love these baby cows! 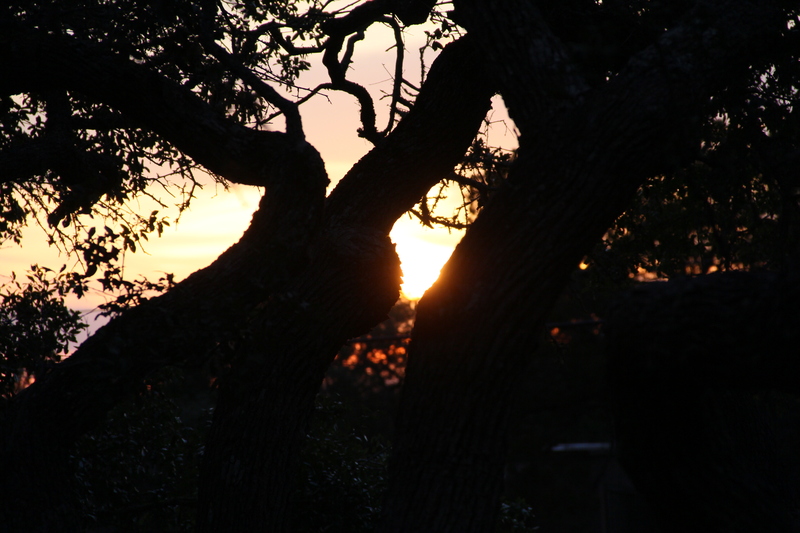 We had typical TX spring weather – Thursday was probably 80 degrees, windy on Friday as the front moved in, rainy on Saturday and Sunday started out crisp in the morning and turned out to be a perfect day – I even cleaned the car and took it to the car wash when I got back from retreat. This morning it was 36 degrees, a little breezy and the heater is on! Now time to unpack and get ready for the next adventure! 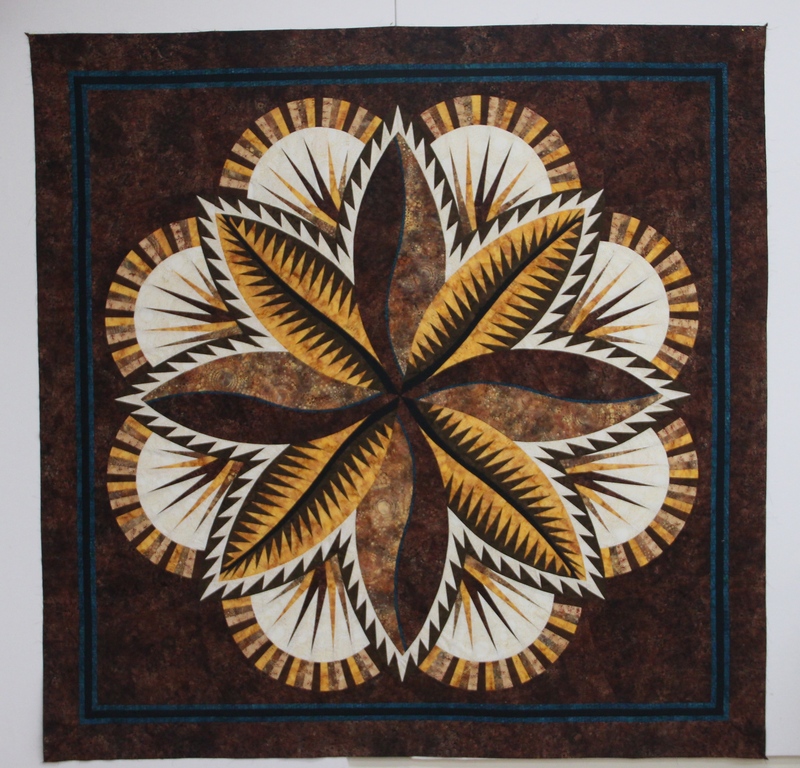 This entry was posted in HollyDee Quilts, Quiltworx, Retreats, Workshops and tagged Fire Island Hosta, Paradise In Blooms, Quilt Retreats, Wimberley, Wimberley Quilt Ranch. Bookmark the permalink. 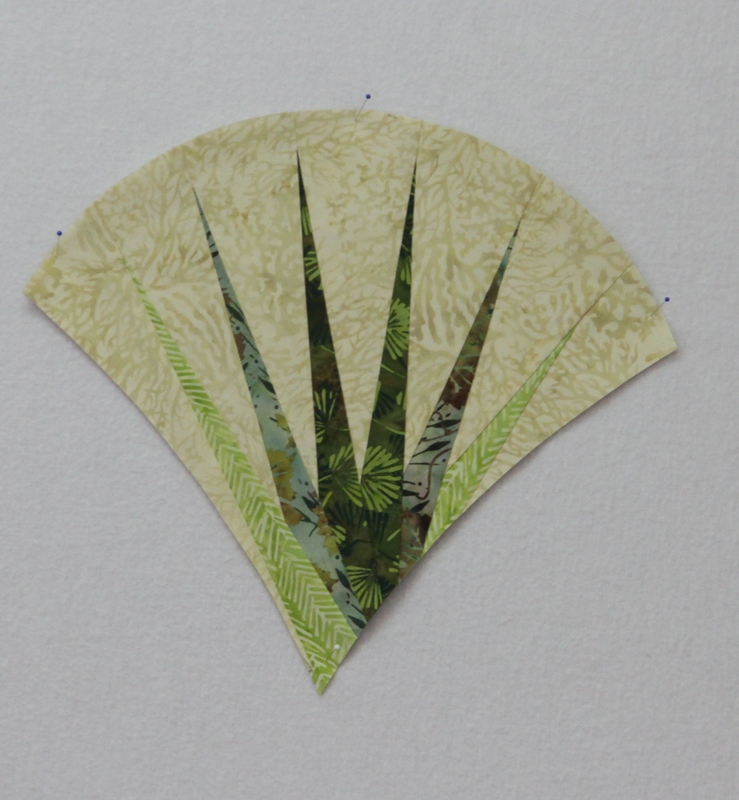 3 Responses to Hot Hot Hot – Fire Island Hosta – Retreat! I’m honored to be in your group and to be your cook. 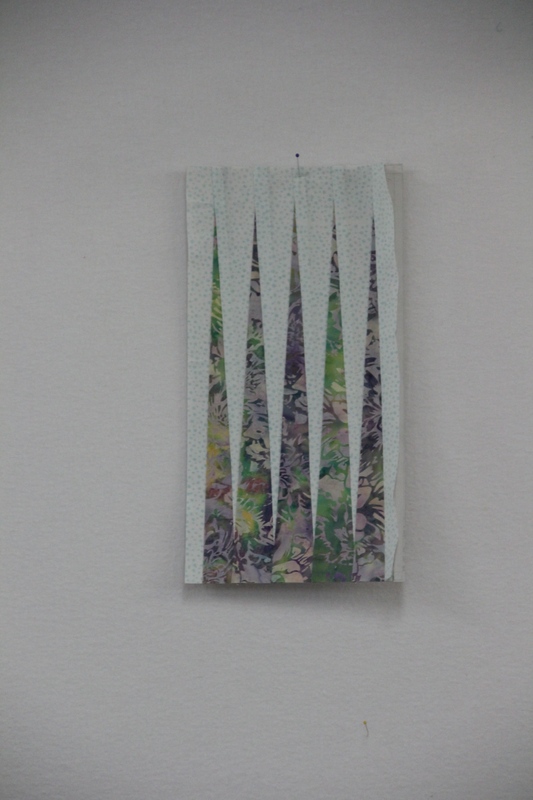 I loved sewing with everyone. OMG!!! I was blown away on how one quilt can be so dramatic with all the different colors we 12 had chosen and “loved” them all. What a wonderful group of ladies to play with all weekend and so want to do that again with all of you!! Ronda the food was fabulous and now back on the diet! Have already signed up for the April Retreat and cant wait!! !